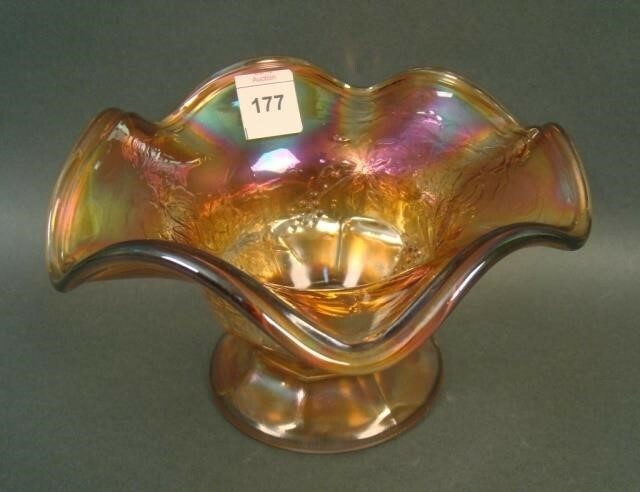 Whether its a ruffled bowl or a dome-footed compote, this is a very unusual piece. 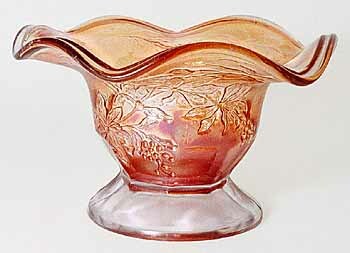 Photographed by Dave Doty at the 1993 American Carnival Glass Association convention, the piece on the left had been found by Titus Hartley at a nearby shop. John Britt, in writing about it later, named it for the floral elements around the exterior. Nobody knows who the maker might have been, but a guess is Dugan as it has the dome foot and a general Dugan “feel.” It also looks a little like a smaller brother to the Christmas Compote. In 2005, Michael Samuels sent the photo on the right of a plate flattened from the bowl. He had found it at an auction earlier in the year.